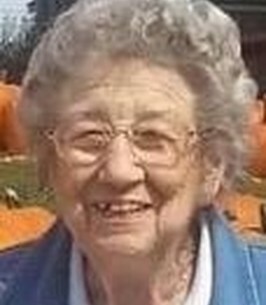 Velva America Lindsey, 95, passed away in her home on November 16, 2018. She was born on April 30, 1923 to Jack and Judith (Hay) Rowland of Dearborn, MO. She later moved with her family to Weston, MO. Velva married Elmer B. Lindsey on April 25, 1953. She was preceded in death by her husband, her parents, 4 brothers and 1 sister. She is survived by her 2 brothers Wilbur “Baldy” Rowland (Jane) of Yuma, Arizona, and Clyde E. “Buck” Rowland (Sigrid) of Weston; 1 sister in law Beverly Lindsey of Colorado; and many nieces and nephews. Velva was a member of the Weston First Baptist Church and the Ladies Auxiliary. She was a huge Royals fan and loved spending time with her family. A visitation will be held 10:00 – 11:00 a.m. Wednesday, November 21, 2018 at Vaughn Funeral Home in Weston; followed by an 11:00 a.m. funeral service. Interment will follow at the Pleasant Ridge Cemetery in Weston. The family suggests contributions be given to the First Baptist Church of Weston. To send flowers to the family of Velva Lindsey (Rowland), please visit our Heartfelt Sympathies Store. We encourage you to share any memorable photos or stories about Velva. All tributes placed on and purchased through this memorial website will remain on in perpetuity for future generations.